The winners of the 2018 EU Prize for Cultural Heritage / Europa Nostra Awards, Europe’s top honour in the field, were celebrated during a high-profile awards ceremony in Berlin on 22 June 2018, in the presence of the Federal President of Germany Frank-Walter Steinmeier and Maestro Plácido Domingo, President of Europa Nostra. They announced and presented the 7 Grand Prix laureates, chosen from among this year’s 29 winning achievements. The Ceremony is among the highlights of the first ever European Cultural Heritage Summit, one of the key European events of the European Year of Cultural Heritage 2018, which is taking place in Berlin from 18-24 June. The Public Choice Award went to the rehabilitation of the Botanical Garden of the National Palace of Queluz, Sintra, Portugal. Some 6,500 people voted for their favourite heritage achievements in Europe via an online poll conducted by Europa Nostra. During the Ceremony, the EU Prize for Cultural Heritage / Europa Nostra Awards 2018 were presented to 29 winners from 17 countries taking part in the EU’s Creative Europe programme. In addition, a remarkable heritage achievement from Turkey, a European country not participating in that programme, also received a Europa Nostra Award. 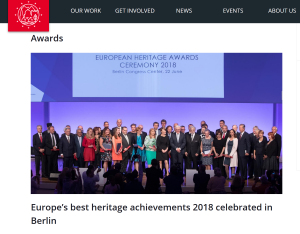 The Awards Ceremony was attended by some 1,000 people, ranging from high-level officials from EU Institutions and Member States to leading representatives of heritage organisations from all over Europe. The European Cultural Heritage Summit ‘Sharing Heritage – Sharing Values’ is co-hosted by the German Cultural Heritage Committee (DNK), the Prussian Cultural Heritage Foundation (SPK) and Europa Nostra. It is supported by the European Commission, the German Federal Government Commissioner for Culture and the Media and the Berlin Senate Department for Cultural Affairs and Europe as well as many German and European partners, associates and private sponsors.